Storage and Interior Concepts were asked to submit a proposal to refurbish the first floor offices at Mattioli Woods in Leicester, we were awarded the contract and it has just been completed to the customers satisfaction and on time. 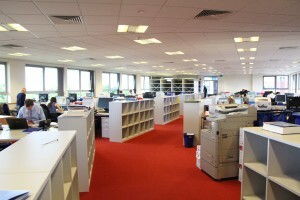 The refurbishment included new bench furniture, bookcases, pedestals and mobile shelving for 90 personnel. If you are looking to refurbish your office space then way not contact us on Melton Mowbray 01664 410414 or use the contact form here.